When I think of Firefly Villa, two words come to mind: grand and spacious. The decor is so chic, it looks like its out of a magazine, and all the rooms blend into one another. There’s a grand piano in the living room, marbled walls in the kitchen, and an oversized sunken tub in the bathroom. Old Trees #6 is actually two adjacent units that were joined into one apartment, but you’d never be able to tell. The housekeeper, cook, and on-site Villa Manager will make sure you don’t have to lift a finger, and there’s no need to drive because the ocean is right in your backyard. Old Trees #6, also known as Firefly Villa, is a luxury apartment within seconds of the beach and with magazine-worthy design. The property has a full staff, with an on-site villa manager, housekeeper, laundress, chef, and beach butler service. Two balconies face the sea, perched above the beach. One balcony holds the well-sized swimming pool, sun beds, and a staircase to the communal gardens. These gardens surround another freeform pool with a waterfall, and lead to Payne’s Bay golden sands. On the beach, guests can enjoy butler service as they recline in provided chairs and umbrellas. The other balcony holds a bar and marble dining table with seating for 14. Follow the pool balcony inside, and a comfortable lounge area leads to the expansive living room. The living room’s high ceilings and neutral, luxe furniture makes the space feel even bigger than it actually is. Play a tune on the grand piano, watch a movie on the TV, or snuggle up into one of the plush couches for an afternoon nap. The extensive kitchen faces the living area, with marble walls and stainless steel appliances. Two refrigerators, two wine coolers, and a breakfast bar round out the kitchen amenities. The Master bedroom has sea views and a private terrace, with high ceilings and a chic vanity. A flat screen TV, king-sized bed, and ensuite bathroom with an oversized bath tub and shower. The second bedroom also has a king-sized bed, high ceilings, and ocean views. The ensuite bath has a shower and sleek design. The third bedroom has a king-sized bed, private terrace with ocean views, and an ensuite bathroom with a sunken tub and shower. The fourth bedroom has two twin beds, private terrace overlooking the sea, and an ensuite bathroom with a sunken tub and shower. The fifth bedroom has a king-sized bed, two twin beds, and an ensuite bathroom with a shower. This bedroom can also be converted into a media room with a convertible couch. Guests at Old Trees #6 have direct access to Paynes Bay beach, which has several bars and snack stands. Sun chairs and umbrellas are set out every day on the sand by Old Trees staff. Guests can jet ski, sail on catamarans, and swim in the calm waters. 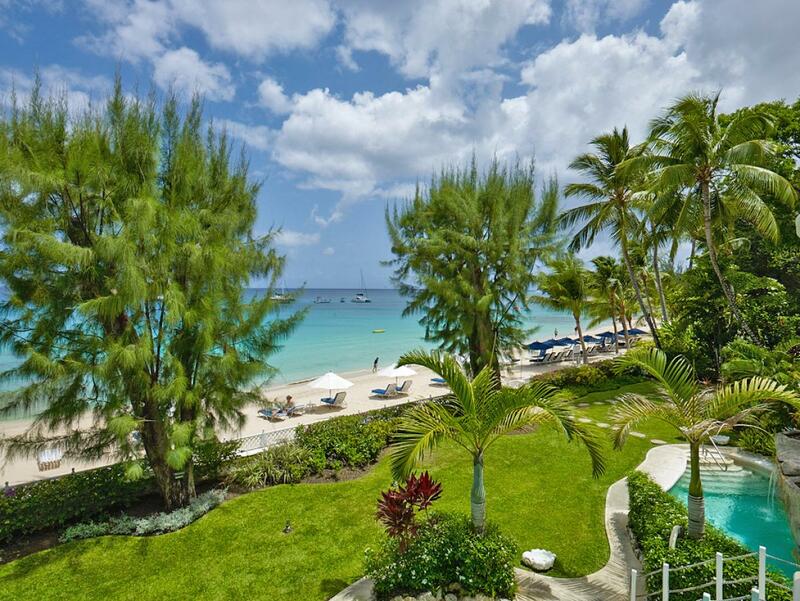 The Old Trees development offers 24 hours security, and is near golfing at Sandy Lane Estate.